In 1972, photographer Nick Ut took an iconic picture that helped changed the course of the Vietnam War. It won the 1973 World Press Photo of the Year award, a Pulitzer Prize for Spot News Photography and remains one of Time magazine’s Most Influential Images of All Time. In 2016, Facebook banned it. The photograph, called “The Terror of War”, showed a group of children running away from their village after a napalm attack. One of them, nine-year-old Kim Phúc, had torn off her burning clothes. The photograph was published worldwide in newspapers and magazines when it was released by Associated Press in 1972, but when Norwegian writer Tom Egeland posted the picture (along with six others) in a 2016 Facebook discussion of photos that changed the history of warfare, the post was deleted and Egeland’s account suspended. Norway’s largest newspaper, Aftenposten, took up the story, wrote about the suspension, re-published the picture on the newspaper’s front page and shared it on Facebook. That post too was deleted. Then Norway’s prime minister, Erna Solberg, shared the image saying, “Facebook is wrong to censor such pictures. It helps to slow freedom of speech.” Her post was also deleted. … But, dear Mark, you are the world’s most powerful editor. 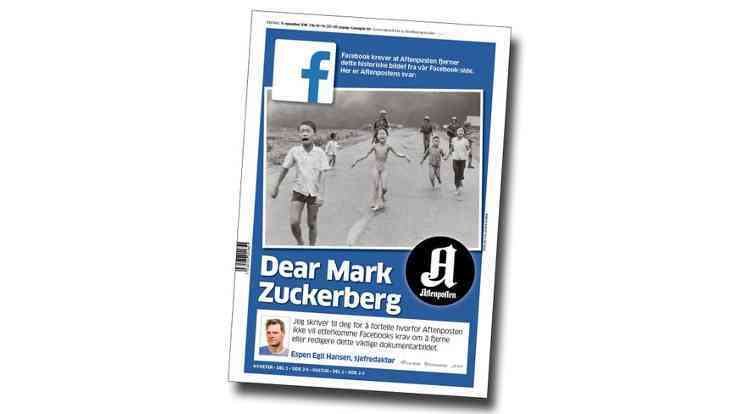 Even for a major player like Aftenposten, Facebook is hard to avoid. In fact we don’t really wish to avoid you, because you are offering us a great channel for distributing our content. We want to reach out with our journalism. However, even though I am editor-in-chief of Norway’s largest newspaper, I have to realize that you are restricting my room for exercising my editorial responsibility. This is what you and your subordinates are doing in this case. I think you are abusing your power, and I find it hard to believe that you have thought it through thoroughly. Let me return to the picture I mentioned by Nick Ut. The napalm-girl is by far the most iconic documentary photography from the Vietnam war. The media played a decisive role in reporting different stories about the war than the men in charge wanted them to publish. They brought about a change of attitude which played a role in ending the war. They contributed to a more open, more critical debate. This is how a democracy must function. The free and independent media have an important task in bringing information, even including pictures, which sometimes may be unpleasant, and which the ruling elite and maybe even ordinary citizens cannot bear to see or hear, but which might be important precisely for that reason. The media have a responsibility to consider publication in every single case. This may be a heavy responsibility. Each editor must weigh the pros and cons. This right and duty, which all editors in the world have, should not be undermined by algorithms encoded in your office in California. Kim Phúc’s burns were so severe that it didn’t look like she’d survive, but after 14 months in hospital, 17 separate operations and the with the help of two world-renowned plastic surgeons, she did and now lives in Canada, though her injuries still require treatment. In September 2012, Nick Ut became only the third person inducted by the Leica Hall of Fame for his contributions to photojournalism. He retired in 2017.